Gabi founded Tenufa 25 years ago as a project within Livnot U’lhibanot, an educational institution in Tzfat, as a natural extension of his community activism as a teenager growing up in a disadvantaged area of Jerusalem. 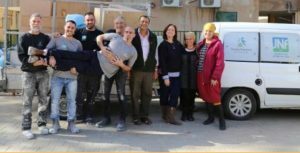 His vision and tireless efforts – backed by donors throughout the world – have built Tenufa into Israel’s largest home repair program and the only one to take a holistic approach to family rehabilitation. Yaron has served as Tenufa’s energetic “can-do” National Work Team Foreman since its inception as an independent organization in 2014. Previously, Yaron managed his own successful building contractor business for 20+ years while carrying out extensive voluntary activities. Abby brings a practical approach, an energetic nature and a warm heart to the overwhelming challenges faced by Tenufa’s clients. She and her team work tirelessly to link families with municipal services in the areas of employment, health and welfare. Dr. Efrat Altshul-Schorr – CEO of Ceremonie Tea, PHD University of Maryland in Developmental Psychology. ChaimDuek – TenufaBakehila’s Treasurer. Accountant and Director at CDK Accountants in Jerusalem.Responsible for supervision of non-profit organizations. Senior mentor at the Center for Entrepreneurial Development. Joe Gelb – Member of TenufaBakehila’s Executive Board. President of Suite Solutions. Content strategist, DITA and XML expert. ElieGertel – Owner of SCG Real Estate. Janine Kutliroff – Co-founder and CEO of Omek Interactive. Previously served as CEO of IDT Global Israel. Dr. Ya’akovMimran – Director and Petroleum Commissioner of Energy Exploration for Israel’s Ministry of National Infrastructure. Dr. Jennifer Solomon – Physician at American Israel Medi-Plan. Previously served as a physician at New Jersey Physicians LLC. Owner of Jennifer Solomon, MD LLC. Physician at South Nassau Primary Care. Rabbi Mabrato Solomon – Director of The Rabbinical Ethiopian Leadership Program at Herzog College. Teacher and counselor. Meir Solomon – Member of TenufaBakehila’s Executive Board. Attorney. Writer and analyst for several newspapers. Gabi Nachmani – Executive Director of TenufaBakehila. Served for 28 years as Community Service Program Director at Livnot U’Lehibanot. Earned his B.Sc. in agriculture from the Hebrew University in Rechovot. Graduated with honors in non-profit management at the school of management in Jerusalem.